It’s Saturday morning. Coffee’s brewing and the cobwebs are clearing. Skip the honey-do list. It’ll be there when you return. Instead, grab your bike and let Kickin’ Asphalt Bicycle Club take you for a ride. The fresh air will do you good. From its start in 2006, Kickin’ Asphalt grew from a few friends and casual acquaintances to 128 cyclists today. Ride frequency increased from twice a month to twice each week. Members came from the Lowcountry and beyond, including Wisconsin, Iowa, and Canada. On Saturday and Sunday mornings, bike tires start rolling somewhere in the Lowcountry. Volunteer ride leaders organize the Saturday rides. They plan the route, register cyclists, deliver a safety talk and account for everyone at the end. Rides range from 20 to 40 miles, with two distance options provided. Speeds vary from 13 to18 miles per hour. Sunday rides follow a “show-n-go” format, without a formal ride leader, and the pace starts at the high end of the range. Hilton Head rides take advantage of the island’s extensive multi-use pathway system. These rides provide a great introduction to the club for potential new members and area visitors, revealing views you can’t see from a car. Twice per year, members rest their road bikes and hit the beach for a “fat tire” ride on hard-packed sand. Beyond the island, routes tour Bluffton, Hardeeville, Beaufort and Ridgeland. The “Piggly Wiggly to Palmetto Bluff” route, the “Pink Pig” ride along shaded country roads and the “Parris Island” ride on the grounds of the Marine Corps Training Depot are favorites. If asked why they ride, most members respond with expected answers: for fitness, socialization and fun. “I ride ’cause I love to eat,” shouts an anonymous member. Many helmeted heads nod in agreement. Kickin’ Asphalt member Larry Meyers said, “It’s primarily a way to spend time with the love of my life, involved in an activity we both enjoy.” He noted that the club’s rides provide a way for friends to spend a morning cycling together, each at their own pace. Speaking of love, smiling Sandy Turnbull noticed a happy lady on club rides in the spring of 2007. Turnbull rides strong and fast, but he held back one special morning to talk with Janeth Haslem. “The first time we talked was his birthday in 2007,” Haslem said, “and then he took off for Massachusetts for the summer.” She left soon after for her summer job in Maine. Three weeks later they spoke by phone. The following week Turnbull “stopped by” the coast of Maine on his sailboat. 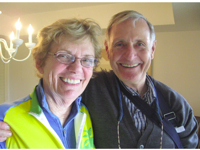 Two years later, they bicycled as husband and wife on their honeymoon. 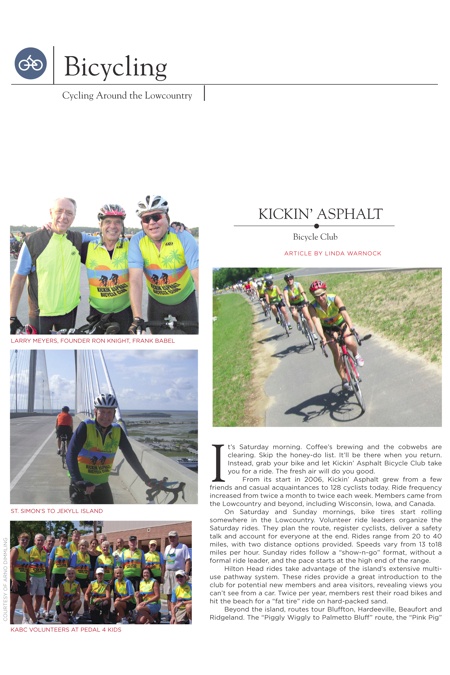 In 2008, the League of American Bicyclists named Kickin’ Asphalt Southeast Bicycle Club of the Year, based on growth of membership and programs, contribution to community and improved conditions for bicyclists. In 2010, Kickin’ Asphalt formalized its support of the Pedal 4 Kids bicycle ride for the Boys & Girls Club of Hilton Head Island. Kickin’ Asphalt is now a named sponsor, providing volunteers with specialized cycling knowledge. Additional outreach activities include the Ride of Silence, Bike to Work Day, bicycle rodeos and Hilton Head Island’s Bicycle Friendly Community initiative. Kickin’ Asphalt embraces its “Safety First” motto. All cyclists must wear a helmet and carry water. Bright clothing is encouraged to enhance visibility. Voice commands and hand signals announcing turns, stops and potential hazards are expected. Join Kickin’ Asphalt for a test ride. Helmets are required, but spandex is not. The ride calendar, including start location, distance and difficulty, is available online at kickinasphalt.info. Annual membership is $20 for individuals and $25 for families. The fresh air and scenery are free. I would like to join you and see if I would like to join. I’m from Vermont and ride quite a bit in the summer.